Everything about this spicy guacamole brunch sandwich is good! It has a crisp toasted bun, juicy sausage covered in melty cheese, fluffy eggs and guacamole! 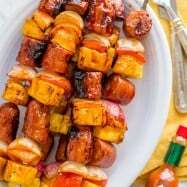 Big thank you to our friends at TABASCO® Brand who sponsored this delicious recipe. We are particularly smitten with the spicy guacamole. Tip: Triple the guacamole and serve extra on the side with chips. It will disappear fast! 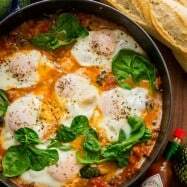 Brunch-time is the best time to throw a party and feed your friends! It is more laid back and you provide your guests with something luxurious in the middle of their day. It’s unexpected and such a treat. This guacamole sandwich is brunch done right! This recipe makes 2 sandwiches but you can easily multiply the ingredients to feed a larger group (see tips below on cooking for a crowd). 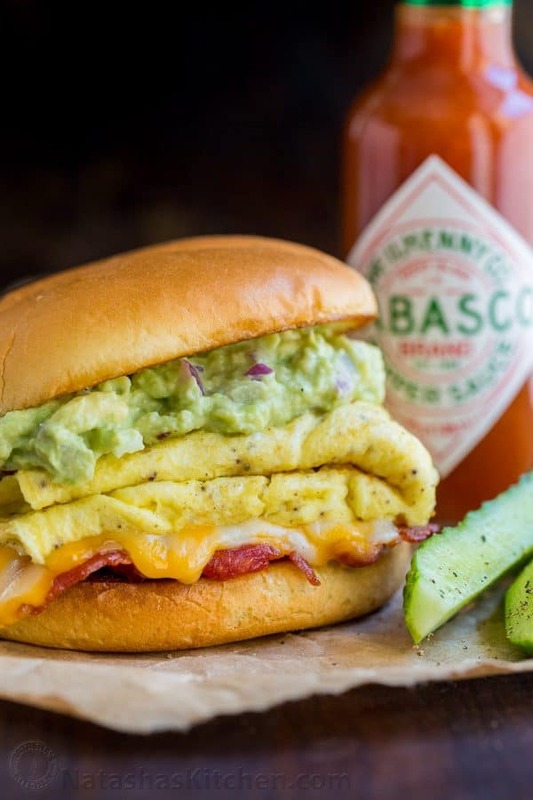 This guacamole sandwich is brunch done right! Did you know TABASCO® Sauce has just three ingredients; red peppers, salt and vinegar? It works perfectly with everything in this sandwich. 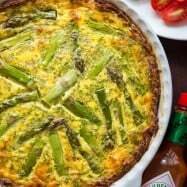 Precook your eggs and cover to keep warm. Throw several sausage patties on the grill at once. Towards the end of the grilling time, butter and quickly grill all of the buns together. Serve assembly line style pulling cheesy sausages right off the grill. This is so much better than dining out. These guacamole brunch sandwiches will be the highlight of your next summer brunch party! 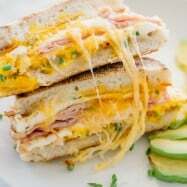 The ingredients are so simple and these sandwiches come together quickly which is perfect for brunch entertaining! P.S. Scroll to the bottom for the bacon option! 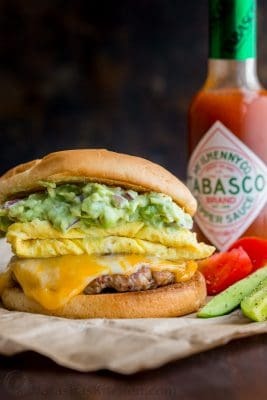 Everything about this spicy guacamole brunch sandwich is good! 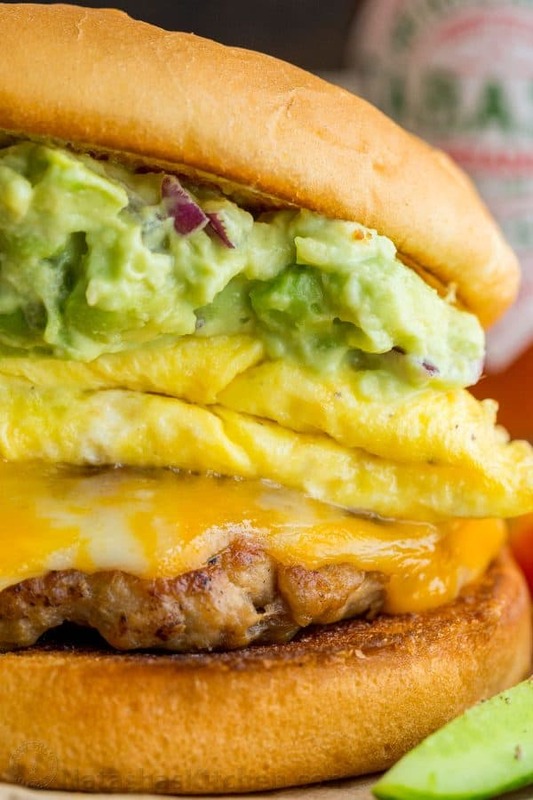 It has a crisp toasted bun, juicy sausage covered in melty cheese, fluffy eggs and guacamole! 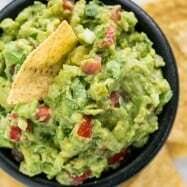 In a medium bowl, add avocado and coarsely mash with a fork. Stir in 3 Tbsp finely diced onion. In a small bowl, stir together 1 Tbsp mayo and 1/2 tsp TABASCO® Sauce and add to guacamole. Season with 1/4 tsp of salt or to taste. Cover and refrigerate until ready to use. In a medium bowl, combine 1/2 lb ground pork,1 pressed garlic clove, 1/2 tsp TABASCO® Sauce, and 1/2 tsp salt. Mix with your hands just until well blended. Divide into 2 patties, flattening them into 1/4" thick patties (don't make them any thicker since they shrink and plump up). Heat a non-stick surface like cast iron over medium-high heat. Lightly butter the cut-side of buns and toast buttered side only in pan until golden brown then remove to 2 serving plates. In the same skillet add sausage patties. Cook undisturbed 2 minutes then flip, top each with 2 slices of cheese and cook additional 2 minutes. Remove pan from heat and cover with lid to keep patties warm and cheese melty. While the sausages cook, place a medium non-stick pan over medium heat and add a dab of butter. Add 2 beaten eggs and push eggs around with your spatula at first then let cook undisturbed until nearly set. Fold the egg in half and in half again then remove from heat. 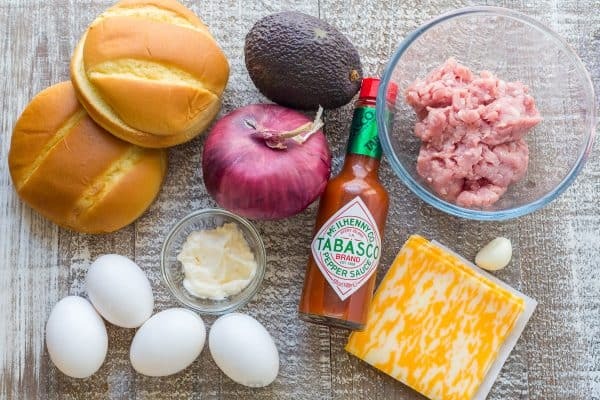 Transfer your first cheesy sausage over the bottom bun and top with your folded egg. 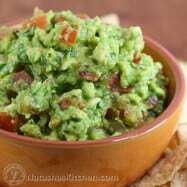 Spread with a generous amount of guacamole and cover with top toasted bun. Repeat steps 3 and 4 with remaining 2 scrambled eggs to finish the second sandwich. Serve warm with more TABASCO® Sauce as desired. For 2 sandwiches, you will need 4 strips of bacon, cut into halves. Sauté the bacon on a pan until browned. Divide bacon into 2 portions and arrange slices side-by-side about the width of a slice of cheese. Turn off heat, top bacon slices with cheese, then cover with lid until cheese is melted. Do you love brunch as much as we do? What is YOUR favorite time of day to entertain? I love your video. The sandwich is must try.BTW, I never heard or used Tabasco. (please don’t judge!). They say tomorrow is a new day and for me it will be. I will be buying Tabasco.